ATLANTA — Unbeaten Atlanta scored 13 points in the fourth quarter to pull away from the Dallas Cowboys en route to a 19-13 win at the Georgia Dome Sunday night. Atlanta moves to 8-0. Dallas falls to 3-5. The Cowboys play at Philadelphia next week. “We didn’t do enough to win this game,” Cowboys coach Jason Garrett said. “We have to find a way to make enough plays to win. They are a very talented team. They won eight games for a reason." Michael Turner scored on a 1-yard run and Matt Bryant kicked two field goals in the fourth quarter to break open a close game. Turner finished with 102 yards on 20 carries, including a long of 43 yards. Matt Ryan threw for 342 yards, but no touchdowns. Roddy White had seven grabs for 118 yards and Julio Jones had five catches for 129 yards. Tony Romo passed for 321 yards and no interceptions. Miles Austin and Jason Witten each had seven catches and Kevin Ogletree had three for 96 yards and one touchdown. The Cowboys defense, similar to the previous weeks, controlled the game, but wilted late with a couple of missed key tackles. “I thought our defense did a good job early forcing them to kick field goals,” Garrett said. 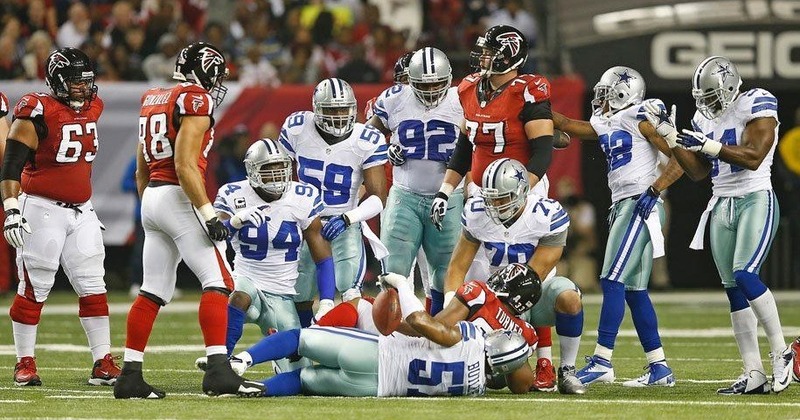 Dallas got off to a good start when the defense forced a punt on Atlanta’s first possession. Dwayne Harris returned the punt 33 yards to the Atlanta 31. Seven plays later, Dan Bailey made a 23-yard field goal to make it 3-0 at the 10:46 mark. Atlanta drove to the Cowboys’ 18, but on a third-and-2 play, Bruce Carter dropped Michael Turner for a 1-yard loss. On fourth down, Matt Bryant’s 37-yard field goal was wide right. Dallas took over and struck quickly when Romo completed a 65-yard pass to Ogletree at the Falcons’ 18. Four plays later, Bailey made a 32-yard field goal for a 6-0 lead at the 3:42 mark. Atlanta finally got on the board with a 45-yard field goal by Bryant on the second play of the second quarter to make it 6-3. Dallas tried to answer by moving to the Falcons’ 37. On third-and-7, Ogletree dropped a pass from Romo. Then Bailey missed a 54-yard field goal wide left. Taking over on its own 44, Atlanta drove to the Cowboys’ 36, but was forced to punt. From their own 3, the Cowboys moved to midfield where they punted on fourth and inches. Atlanta moved from its 12 to the Dallas 28 in 48 seconds where Bryant made a 47-yard field goal on the final play of the half to tie the game at 6-6. “Obviously, we rather have touchdowns than field goals,” Garrett said. Dallas punted away its first possession of the second half after working out from its 14 to the Atlanta 44. Atlanta drove from its 13 to the Dallas 25 where Bryant barely missed a 43-yard field goal to the right at the 6:43 mark. Dallas was on the move and faced a third-and-13 play at the Dallas 41, but a wide-open Miles Austin dropped the pass and the Cowboys punted. Atlanta countered with the first touchdown of the game. The Falcons drove 81 yards in six plays with Michael Turner scoring on a 1-yard run on the second play of the fourth quarter to make it 13-6. After another Dallas punt, Atlanta drove to the Cowboys’ 18, but a sack, short run and an incompletion forced Bryant’s 36-yard field goal to push the Falcons lead to 16-6 with 7:49 left in the game. Now running out of time, Dallas went to its hurry-up, no-huddle offense and it paid off. Dallas drove 78 yards in six plays for a touchdown. Romo threw 20 yards to Ogletree for the touchdown to make it 16-13 with 5:21 left in the game. Romo completed all six of his passes, including two to Jason Witten, who became the Cowboys’ all-time leading receiver on the drive, passing Michael Irvin. With 5:21, Atlanta began its victory march by converting three third downs, including two on short passes to Jacquizz Rodgers, to put the game away. Bryant made a 32 yard field goal to make it 19-13 with 17 seconds left. Four plays later, the game ended with a completion to Felix Jones at the Atlanta 21. “We have to stay together and go back to work,” Garrett said.